Qiu is a leading Chinese authority on the history of Chinese writing. This translation of his magnum opus is highly readable, and it combines both the original 1988 Beijing version (with information on the "Simplified" characters used in the People's Republic) and the revision in the 1994 Taipei edition (which omitted the discussions of the Simplified characters), so it is a more complete version than is available in Chinese. 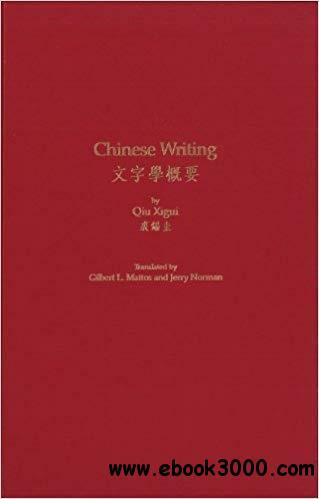 Qiu begins with a typological discussion of the nature of Chinese writing and the many different kinds of characters; the translators, Gilbert Mattos and Jerry Norman, have come up with reasonable new English terminology to render Qiu's various non-traditional categories. These first six chapters (170 pages) can be read with profit by anyone with an interest in writing systems. Qiu is not shy about disagreeing with the classical sources on the topic, notably the earliest one, the Shuowen compiled by Xu Shen toward the end of the 1st century CE. But the rest of the book - almost 250 more pages - which the author probably considered the more important part - is a presentation of the individual histories of the sound and shape of more than 2000 characters, from their earliest appearances in the Oracle Bone Inscriptions down to modern times. They are not given in a dictionary order, but are classified according to the many categories set forth in the first part, so that their complicated histories and interrelationships become clear. The discussions can be found from the index of characters, given in the order of their modern pronunciation.